Crash Forensics offers complete forensic mapping services. 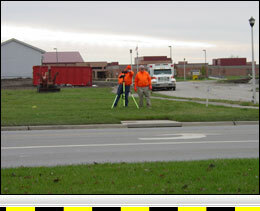 Forensic mapping is the process of using electronic surveying equipment to measure and map vehicular crash evidence. We can map both the crash scene and vehicles. Our forensic mapping produces a very clear and precise record of the crash evidence that can be used to reconstruct the crash. Link to our forensic mapping experts. 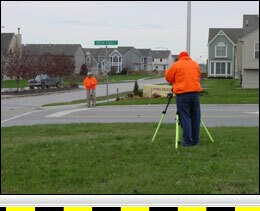 When using forensic mapping to measure the crash scene, the location, shape, and size of evidence can be recorded. Other objects can also be recorded such as road width, shoulders, intersecting roads, sidewalks, and trees. When measuring vehicles, we use forensic mapping to record the vehicle's damage profile, (the outline of the damaged vehicle). Precise damage profiling can help determine impact angles between vehicles for use in crash reconstruction. Also Equivalent Barrier Speed (EBS) calculations can be performed using forensic map measurements. Once the measuring process is complete, the device known as a data collector is downloaded into a PC. After downloading, we import the forensic map file into the Crashzone CAD program. With the file in Crashzone, symbols such as people, vehicles, street names, and evidence descriptors can be added. 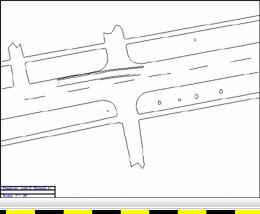 If the damaged vehicles are mapped they can be inserted into the Crashzone file and positioned over the corresponding roadway evidence. We can also map the profile of undamaged exemplary vehicles, which can then be inserted into the scene file and placed over evidence such as pre-collision skids. 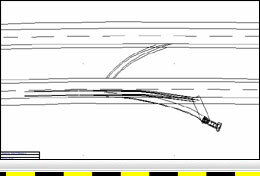 Also the undamaged vehicle profile can be inserted into the damaged vehicle file to overlay and compare the two profiles. Once the map is complete, we can print it on a scaled drawing allowing measurements to be taken directly from the map using a standard engineering scale.